On the 12th day of Christmas we celebrate the Wise Men arriving to where Jesus Christ had been born by following the Star of Bethlehem from the East. Caspar, Balthazar and Melchior brought gold, frankincense and myrrh for baby Jesus. We do not know if the wise men were only three in number or if their names were Caspar, Balthazar and Melchior. 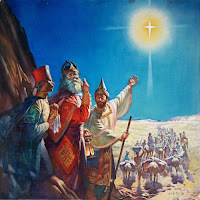 There is an Armenian Christian tradition that Caspar was from India, Balthazar from Arabia and Melchior from Persia. We do know about: how a star was to come forth – Num. 24:17, how He was to be born in Bethlehem Ephrathah – Micah 5:2, how the Gentile nations would flow to Him – Zech. 8:23, Is. 45:14, 60:3-7. As we read the ‘historical’ sections of the Old Testament, it is not always the case that God points out what is right or wrong. We have to rely on passages that speak specifically to a question. Scripture interprets Scripture.God is relating the history of His people without interposing His commentary always. For instance when Abraham lies about his wife and Isaac lies about his wife we know that is wrong, not from some passage in the narrative, but from another passage that teaches or commands or judges. Col. 3:9 “Do not lie to one another, seeing that you have put off the old nature with its practices…” Or when we see a patriarch or king having more than one wife or a concubine we know it is wrong not from an immediate inclusion in the historical narrative, but from a passage that speaks clearly to that point. 1 Cor. 7:2-4 “But because of the temptation to immorality, each man should have his own wife and each woman her own husband. The husband should give to his wife her conjugal rights, and likewise the wife to her husband. For the wife does not rule over her own body, but the husband does; likewise the husband does not rule over his own body, but the wife does.” This shows an exclusiveness that means one man for one woman and one woman for one man. We have started the 3rd batch with 16 students. Two students were dropped for their personal reasons. 14 students have been used to attending the classes regularly from various parts of the A.P. and T.N. states attending four days a week. Total of 15 students–one is tutored. We have established a good rapport with our class students and they feel free to interrupt the lessons when they have questions. We have double purposes in each lesson – to present the book in its proper relation to the entire scope of the Bible and bring out one grand truth, one practical lesson from each book. We may cover several sub themes, but keep coming back to the main lesson. The closing portion of our lesson is of prime importance. Our desire is to present Christ in a winning way, our constant dependence on prayer, and our utter reliance on the guidance of the Holy Spirit. Jesus knows the ability and weakness of each student. Our written examinations, oral test and assignment work is something for every one. We have been conducting monthly unit tests on Martin Luther’s Small Catechism, four gospels, O.T. review. We have been conducting written examinations and oral tests three months. The students of MLBS are encouraged to participate in the gospel team service and also Sunday worship services under one BELC pastor.